Learn with your children about animals. 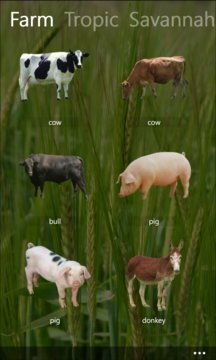 This fun app is great for young kids and toddlers to learn the names and voices of animals. Creatures of farm, forest, tropic and savannah are placed on the animated sceneries. The animal voice sounds when you tap them. 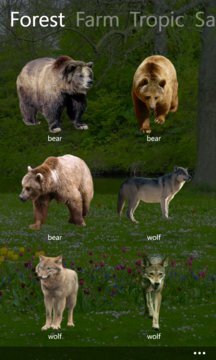 Each animal has different voice patterns. Every minute, a unique sound pattern is created from the chant of birds. Relax and enjoy views with soothing sound auras. - use the app tile for scenery preview.